The Space Shuttle Atlantis is pictured while being transported from the Orbiter Processing Facility. 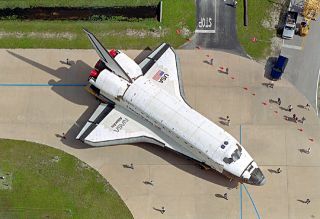 In this historical photo from the U.S. space agency, the Space Shuttle Orbiter Atlantis, carried atop an orbiter transporter, makes the short journey from Orbiter Processing Facility Bay 3 to the Vehicle Assembly Building (VAB). This photo was taken on Aug. 11, 1997 from the roof of the 525 foot tall VAB. The rollover of the orbiter is one of the prelaunch milestones. Atlantis is being readied for the next mission, STS-86, which is targeted for a September launch. STS-86 will be the seventh of nine planned dockings of the Space Shuttle Orbiter with the Russian Space Station Mir.